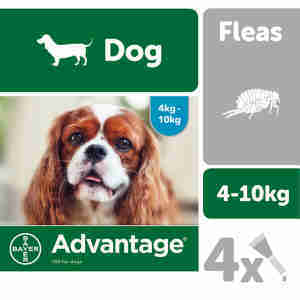 Advantage 100 for Dogs 4-10 kilograms works quickly to kill irritating biting lice and fleas. Is there anything more annoying than fleas? Their bites are painful and can become infected. They also spread nasty diseases and parasites like tapeworms. To make it worse, some dogs are actually allergic to flea saliva. This can give them a horrible skin condition called flea allergy dermatitis. If your dog is scratching a lot, seems a bit restless or has swollen patches of skin, they might have fleas. It's a good idea to give them a once-over with a flea comb. Check warm areas like the ears, armpits, feet and tail. As fleas can spread tapeworms, it's worth giving them a worming treatment like Drontal Dog Tasty Bone Tablets. one application lasts up to month. The treatment is super easy to apply. It comes in a little pipette so you can drop it straight onto the skin at the back of your dog's neck, where it's impossible for your dog to lick or scratch it off. Once it's on the skin, it gets transported around your dog's body by their natural skin oils. The treatment lasts for about a month, then you can redo it if it’s needed. This treatment works really fast. You can expect fleas to stop biting your dog in about three to five minutes (hurrah!). Both adult fleas and their larvae will drop dead within about twenty minutes. The medicine is safe to use on any dog or puppy aged seven weeks or older, as long as they weigh between four to 10 kilograms. Oh, did we mention that Advantage 100 for Dogs 4-10 kilograms is waterproof? Your dog can still go for a nice swim (or bath – maybe less nice!). Each tube contains 1 ml (100 mg imidacloprid). The product also contains benzyl alcohol and butylhydroxytoluene (E321) as an antioxidant. I have always used Advantage for my dog every month and have never seen a flea on her. Great product easy to deal with good prices and delivery, well done.